Californians didn’t invent the car, but they like to think, with some justification, that they invented the automobile lifestyle. With drive-thru grocery stores, drive-thru pharmacies, drive-thru churches and even drive-thru mortuaries, one gets the feeling that if Californians could only invent a drive-thru delivery room they could happily go from cradle to grave without ever having to pull over to the curb. California is a land of supersized distances, jumbo landscapes and big-gulp vistas, and the best way to see it all is on a road trip, or, better yet, a series of road trips. Here are a few of our favorites. Northern Californians call it “Highway 1” and Southern Californians call it the “Pacific Coast Highway”—or, simply, the “PCH”—but there’s no doubt that the road that hugs the state’s remarkable coastline, often close enough to feel the salt spray, is one of the world’s classic driving trips. From the sun-splashed Southern California beaches to the misty redwood forests near the Oregon border, the journey, which includes a few stretches on other highways, is a touch over 1,000 miles. The sights are so numerous we can barely scratch the surface: The Hotel Del Coronado, where Marilyn Monroe frolicked in Some Like It Hot; classic surfing beaches made famous by the Beach Boys; star-studded Malibu; Riviera-like Santa Barbara; Hearst Castle; Big Sur; Santa Cruz, with its old-timey beach boardwalk; San Francisco; Point Reyes National Seashore; artsy Mendocino; Redwood National Park. A few tips: Allow far more time than you think you need; besides the frequent diversions, the road is so winding in places it’s hard to average more than 30 miles per hour. If you’re prone to carsickness, this isn’t the trip for you. Keep your gas tank full and your bladder empty. In some areas, particularly Big Sur, it’s more than 40 miles between gas stations—and bathrooms. Highway 395 hugs the state’s eastern border, and the 264-mile stretch of high desert from Reno to Lone Pine, which passes tumbleweeds, swinging-door saloons and ghost towns beneath the breathtakingly sheer eastern wall of the Sierra Nevada, is one of California’s most iconic drives. The northern stretch traverses ranchland that was once—and some-times still is—the domain of Basque sheepherders, and in the town of Gardnerville, just over the border in Nevada, you have your choice of excellent Basque restaurants. As you drive south, keep an eye out for cowboys, although these days they’re as likely to be riding an all-terrain vehicle as a horse. 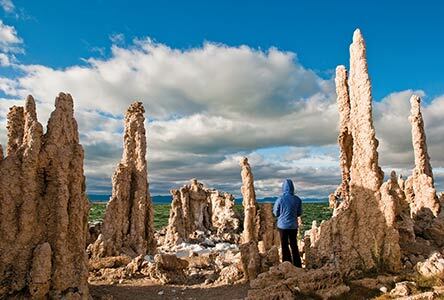 Farther south, as you approach Mono Lake, you’ll probably encounter members of the Washoe and Paiute tribes. Highway 395 grazes the shore of enormous Mono Lake, which is so alkaline Mark Twain once joked he could do his laundry merely by dragging it behind him in a boat. In Bishop, the studio of the late photographer Galen Rowell has become a major attraction. Stop at Manzanar, just off the highway, for a poignant visit to the site of a relocation camp for Americans of Japanese heritage during World War II. In Lone Pine, the Indian Trading Post sports autographs on the wall from Gary Cooper, John Wayne and other cinematic cowboys who filmed Westerns in the nearby Alabama Hills. A few tips: Springtime, when the Sierra is still clad in snow, is the prettiest time for the drive, although some side trips may be limited. For an overnight stop, the town of Bishop offers the largest selection of motels and restaurants. You don’t have to spend days or weeks on the highway to see the best of California. Within easy reach of major cities are exquisite road trips you can do in less than a day. Head north, across the Golden Gate Bridge, to sample some of Northern California’s most bucolic scenery. Almost within sight of San Francisco’s skyscrapers you’ll come to Muir Woods National Monument, a cathedral-like preserve of old-growth redwoods at the foot of Mount Tamalpais. Follow Highway 1 to Point Reyes National Seashore, where you might catch tule elk grazing on misty hillsides above the wave-battered coast. West Marin County, with its organic farms, artisanal bakeries and gourmet cheesemakers, is the breadbasket for San Francisco’s foodie culture. Stop for lunch at the Hog Island Oyster Farm, where you can munch on bivalve mollusks pulled straight out of Tomales Bay. The long, narrow bay, incidentally, is a submerged section of the notorious San Andreas Fault. Farther north on Highway 1 you’ll come to Bodega Bay, a sleepy fishing village where Alfred Hitchcock unleashed avian terror in The Birds. The Tides restaurant, where terrified townspeople took shelter, is still there, although hardly recognizable in its current form. A few miles inland, in the separate town of Bodega, you can find the familiar schoolhouse and church from the movie. Continue on to Sebastopol, renowned for its juicy Gravenstein apples and an outpost of Sonoma County’s wine country. Turn south on Highway 101 and head back to San Francisco, stopping for a celebratory cocktail in Sausalito, with the lights of the city twinkling across the bay. On a day trip along the Angeles Crest Scenic Byway you’re more likely to spot a bighorn sheep than a Kardashian. Not many places in the greater Los Angeles area can make that boast. Winding up and over narrow ridgetops in the San Gabriel Mountains, above the smog, your vistas can range from the vast, chocolate-brown Mojave Desert to Catalina Island. Also known as State Highway 2, the 66-mile-long Angeles Crest Scenic Byway was built 100 years ago to be “the most scenic and picturesque mountain road in the state.” Access it from the suburb of La Canada Flintridge at the western end of the San Gabriel Valley. The popular side-trip hike to the summit of 6,164-foot Strawberry Peak is currently closed due to a 2009 fire, but as you drive east on the narrow two-lane road keep an eye out for bears, mountain lions and bighorn sheep. Another side trip brings you to the Mount Wilson Observatory, where astronomers found the first observational evidence for the Big Bang theory. If you’ve brought along your fishing rod, try your luck in Little Rock Creek near the Mt. Waterman Ski Resort. Farther east, the road crosses the 2,665-mile-long Pacific Crest National Scenic Trail: From here you can hike south to Mexico or north to Canada. From the road’s end at Highway 138, head southeast to Interstate 15, which will whisk you back to the Los Angeles basin. Cross the Palomar Mountains to soak up the vast and colorful Anza-Borrego desert on a daylong drive from San Diego. Make your way north on I-15 and east to Ramona, and then continue on to the ridgetop town of Julian. A beautifully preserved relic of an 1870s gold rush, Julian these days is renowned for apples. You’ll smell the aroma of baking pies as soon as you step out of your car. Stop for a slice, just out of the oven, warm and gooey with a scoop of French vanilla ice cream. The air here is so clean, and the views so extensive, that the California Institute of Technology built the Palomar Observatory a few miles away along the ridge. Continue east, downhill, on Highway 78 to Anza-Borrego Desert State Park, a 937-square-mile preserve that encompasses the eastern fifth of San Diego County. If it’s spring, and the winter has been wet, you’ll be treated to one of the most vivid and sweeping displays of wildflowers in the United States. If the flowers aren’t up, there’s still plenty to see. Since 2008, a local landowner has been commissioning artist Ricardo Arroyo Breceda to produce 129 giant sculptures in the desert, everything from life-size replicas of gomphotheres (elephant-like creatures that once lived there) to prehistoric camels and ground sloths to scenes from California history: a Spanish padre, a gold miner and farmworkers. The latest is the undisputed highlight: an enormous sea serpent that undulates so far across the desert that it spans one of the main roads. From here you can retrace your route or take the long way home via the Salton Sea and Palm Springs.